Shrub 1 - 5 m tall Leaves: opposite, stalked, 5 - 10 cm long, as wide or wider, three-lobed, maple-like, base rounded to truncate (cut straight across), lobes pointed, coarsely toothed, palmately veined, slightly hairy on the lower surface. Leaf stalks 1 - 3 cm long, with one to six large glands near the top. Flowers: in branched clusters (cymes). Cymes terminal, flat-topped, 5 - 10 cm wide, with large sterile flowers surrounding much smaller fertile flowers. Fertile flowers five-lobed, white, to 5 mm wide, tubular, sparsely hairy inside. Stamens five, exserted from the corolla. Filaments white. Anthers tan to yellow. Stigma three-lobed. Sterile flowers marginal, five-lobed, white, 1.5 - 2.5 cm wide, slightly irregular. Fruit: berry-like (drupe), in clusters, bright red, 10 - 15 mm wide, rounded, single-seeded. Twigs: stout, ribbed. Form: rounded. Similar species: Viburnum acerifolium and V. acerifolium var. 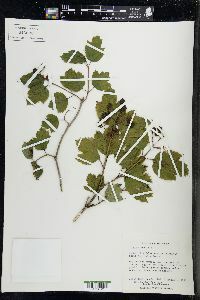 ovatum are similar but have slightly hairy branchlets, purplish black mature drupes, and dots on the leaf undersides. Two varieties of V. opulus occur in the Chicago Region: americanum and opulus. See their links below. Habitat and ecology: A widely planted ornamental introduced from Europe. It has naturalized in woods and thickets by way of birds, which eat the fruit and scatter the seeds. Locally very common throughout the Chicago Region in woods and thickets. Notes: About 200 species of Viburnum occur between North America, Europe and Asia. Many are ornamental shrubs cultivated for their showy flowers, autumn foliage, and attraction to wildlife. Etymology: Viburnum is the Latin word for the Wayfaring tree. 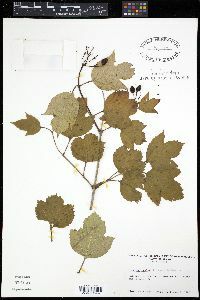 Opulus is the Latin word for a type of Maple. Shrub 1-5 m; young stems smooth; petioles 1-3 cm, with 1-6 large glands near the apex; stipules slender; lvs maple-like, palmately veined, 3-lobed, coarsely toothed, basally obtuse to truncate, hairy beneath, especially on the veins; cymes 5-10 cm wide, on peduncles 2-5 cm; marginal fls neutral, with enlarged, slightly irregular cor 1.5-2.5 cm wide; fr red, 10-15 mm; stone flat, suborbicular, not grooved; 2n=18. Var. americanum Aiton, the high-bush cranberry, with the petiolar glands stalked, round-topped, and mostly higher than wide, occurs in moist woods from Nf. to B.C., s. to Pa., n. O., Io., and Wash. June. (V. trilobum) The Eurasian var. opulus, the Guelder rose, with the petiolar glands mostly sessile, concave-topped, and wider than high, occasionally escapes from cult. June, July. The cult. Snowball is a form of var. opulus with all fls neutral and enlarged.